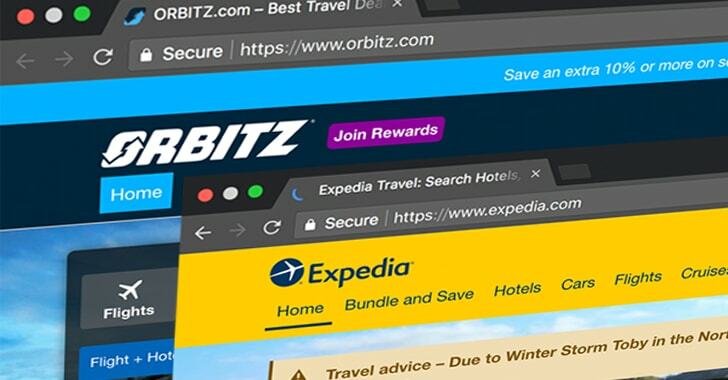 Chicago-based online travel booking company Orbitz, a subsidiary of Expedia.com, reveals that one of its old websites has been hacked, exposing nearly 880,000 payment card numbers of the people who made purchases online. Orbitz.com is a travel fare aggregator website and travel metasearch engine, allowing customers to quickly and easily search and book flights, hotels, rental cars, vacation packages, travel deals, cruises and more. The data breach incident, which was detected earlier this month, likely took place somewhere between October 2016 and December 2017, potentially exposing customers' information from the travel site to hackers. According to the company, hackers may have accessed payment card information stored on a consumer and business partner platform, along with customers' personal information, including name, address, date of birth, phone number, email address and gender. However, the company said its services such as Expedia flights, Expedia hotels, Expedia business account, Expedia car insurance, and Expedia merchant services have not been affected by the breach. Orbitz worked closely with cybersecurity experts and law enforcement to investigate the breach and confirms that the social security numbers for U.S. customers were not exposed in this incident. The company claims to have enhanced the security of its compromised platform, though it assures its customers that the current website Orbitz.com was not impacted. "We deeply regret the incident, and we are committed to doing everything we can to maintain the trust of our customers and partners," Orbitz said in a statement. Orbitz is currently working to notify the thousands of affected customers and plans to offer one year of free credit monitoring and identity protection service. Before looking for hotel bookings, Expedia travel rewards, how to list hotel on Expedia, how to book first class flights on Expedia or how to list hotel on Expedia, you should protect your information. Since the payment card information is now in the hands of cybercriminals, customers are advised to closely monitor their credit card statements and report any unauthorized charges to the issuing bank. It will be quite impressive to see if the company will compensate its affected users with Expedia coupon code, Orbitz rewards or Expedia promo code so that users with Expedia business account can use Expedia points on the website. It will not come as a surprise if Expedia stock price drops as soon as Orbitz and Expedia press release is made public with detailed information on the extent of the breach. For any query related to the data breach, you can call Orbitz or Expedia customer service. Orbitz customer service number is 001-312-279-7740, and Expedia customer service number is (877) 227-7481.